"...Sirs, what must I do to be Saved?" “The thought of foolishness is sin.” (Prov. 24:9). Unbelief is sin: “Of sin because they believe not on me.”(John 16:9). “The transgression of the law is sin.” (1 John 3:4). “All unrighteousness is sin.”(1 John 5:17). The origin of sin: “He that committeth sin is of the devil.”(1 John 3:8). “Thou shalt not steal,” etc. “Thou shalt love thy neighbor as thyself.”(Matt. 23:37-39). Sins of omission are fearfully numerous; and these sins leave the soul in guilt and impotency as truly as do sins of commission. All are included under sin: “We have before proved both Jews and Gentiles, that they are allunder sin.” (Rom. 3:10). The first work that the Holy Spirit does toward leading one to Christ is to convince or convict him of sin. (John 16:3). This He usually does through the preached Word, or through the instructions and admonitions of pious parents or other earnest Christians. The sinner may resist conviction, and drive the Spirit from him: thus preferring to remain in sin and darkness rather than to be saved. But if one will yield to conviction, he will speedily reach the place of true repentance—which is godly sorrow for sin, death to the love of sin, and a fixed purpose to break with it forever. Hear what God’s word says about repentance. Jesus says: “I am not come to call the righteous, but sinners to repentance.” (Matt 9:13). (Acts“He now commandeth all men everywhere to repent.” (Acts 17:30). “Not knowing that the goodness of God leadeth thee to repentance.” (Rom. 2:4). “Not willing that any should perish, but that all should come to repentance.” (II Peter 3:9). “I say unto you that likewise joy shall be in Heaven over one sinner that repenteth.” (Luke 15:7). “The sacrifices of God are a broken spirit; a broken and a contrite heart, O God, Thou wilt not despise.”(Psa. 51:17). “Repent, and believe the Gospel.” (Mark 1:15). “Testifying, both to the Jews and to the Greeks, repentance toward God, and faith toward our Lord Jesus Christ.” (Acts 20:21). When the penitent sinner is thoroughly killed to the love of sin he will no longer wish to commit sin, even if he knew that its penalty would never be visited upon him. He has his fill of sin. When the penitent reaches the place, where he utterly despairs of pardon andsalvation through deeds of law, he is then in a right attitude to accept Christ as his personal Sin bearer and Savior. Faith in Christ, the last step. will be removed; the peace of God will come into your heart and his love will be shed abroad therein. Illustration—If you had a matter of business that had to go through the forms of law, and you knew a perfectly competent and trustworthy lawyer who had skill in attending to just such cases, and you should entrust your business to him, and rest satisfied that he would manage it properly—that would be faith. You might have all confidence in the skill and trustworthiness of the lawyer; but, if you did not entrust your business to him, it would do you no good. Think carefully on this soul-searching question: If you should die right now, do you know for sure that you would go to Heaven? You must accept that you are a sinner. "For all have sinned, and come short of the glory of God" (Romans 3:23). No one is exemptfrom this indictment. Everyone has sinned. (Romans 5:12) says, "Wherefore, as by one man sin entered into the world, and death by sin; and so death passed upon all men, for that all have sinned." No one is perfect and no one can live up to God's perfect standard. We are sinners by nature. You must accept that as a sinner you owe a penalty. "For the wages of sin is death" (Romans 6:23). Because of our sin we owe a debt. This debt is a spiritual death or separation from God in the lake of fire known as Hell. Hell is not a figment of someone's imagination or only a figurative term. Hell is very real. It is a literal burning place. It's not a place where you go because your friends will be there and you want to have a good time. It is a dark, lonely, seething, burning place, and it never ends. It continues to burn for all time. The worst part is, there is nothing you or I can do on our own to avoid it. Outside of Jesus, it is our final destination. If you are depending on your church membership to get you to Heaven, beware; it's not enough. If you pray a lot hoping to get to Heaven, don't depend on that; it's not enough either. Even if you give a lot of money to a church, it's not enough to gain Heaven. Many people think if they are good enough, they will be able to slip in through the gate when no one is looking or find a hole in the gate somewhere. Please, my friend, don't depend on something so shaky. It can't happen that way. There is only one way to get to Heaven. How? You must accept that Jesus Christ has already paid our sin debt. "But God commendeth his love toward us, in that, while we were yet sinners, Christ died for us" (Romans 5:8). Christ was not a sinner, and the Bible teaches that God took all of our sin and placed it on Christ. While Christ was bearing all our sins in His own body, God punished Him in our place to pay the debt we owe. This is not something God promised to do. It is something He has already done. "For God so loved the world, that he gave his only begotten Son, that whosoever believeth in him should not perish, but have everlasting life" (John 3:16). It is a fact: Jesus Christ has already paid your sin debt. You must accept by faith what Jesus Christ did for you. "He that believeth on the Son hath everlasting life: and he that believeth not the Son shall not see life; but the wrath of God abideth on him" (John 3:36). In this verse, the world is divided into two groups: those who are believing and those who are not believing on the Son. Those who believe have everlasting life, and those who don't believe shall not see life. The moment you do this, God promises you are not condemned but have everlasting life and that you will never perish in Hell. "Verily, verily, I say unto you, He that heareth my word, and believeth on him that sent me, hath everlasting life, and shall not come into condemnation; but is passed from death unto life" (John 5:24). If you prayed this simple prayer, fill out the form below so that we may rejoice with you. 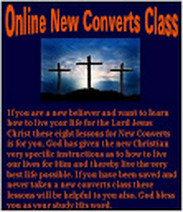 We would also like to send you some free information on how to live the Christian life.